GCU students (from left) Caleb Raney, Jackie Cleek, Luke Corsaut, Mariah Unruh and Ty Nowatzki share their thoughts about life on campus during Thrive. Don’t hole up in your room. Get involved in one of more than 100 clubs, a local mission coaxing homeless off the streets or a Bible study group. Play hard in club sports. Make smart choices. Know when to say “no” and “yes.” Study around others in the coffee shop. Grow spiritually by attending Chapel. Never be afraid to ask for help. Talk to others while standing in line for a chicken sandwich. Make close friends. Stay in touch with your parents. 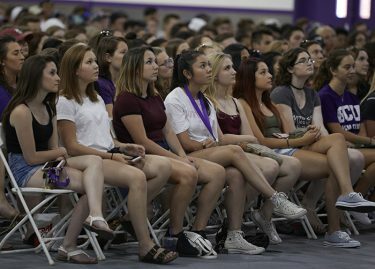 Incoming students listen intently to the thoughts of their new peers. 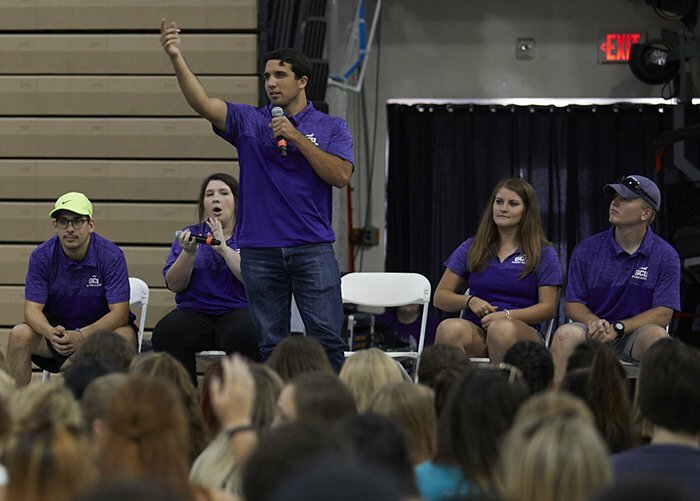 This is a sampling of the sage advice from Grand Canyon University student leaders to new students during Thrive, a Welcome Week program encouraging students to embrace GCU’s vibrant community. “You only have four years on campus. 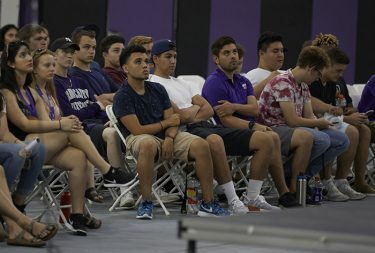 Don’t spend them alone in your room,” said Caleb Raney, a senior Christian studies major from New Mexico, one of five students who shared what they’ve learned about making the most of their GCU years. For the first time, Thrive invited straight-talking, candid students to talk directly to students. According to Robyn Hord, Student Conduct Coordinator, the reason was simple: Students are more likely to take advice from their peers. “They speak with an authentic voice and share their personal experiences,” she said. “If you want to thrive, you must try different things. Join different groups and find one that makes you thrive,” said Mariah Unruh, a senior marketing major from California. Newcomers learned about what to expect away from the classroom. One of the first steps of building a life on campus is getting to know neighbors on the same floor and in the same residence hall, said Jackie Cleek, a senior worship arts major from California. “This is the community you will be part of for the entire year,” she said. Panelists repeatedly encouraged students turn for help from residence advisors, community builders who provide non-stop support in residence halls, and life leaders, students who conduct weekly Bible studies and provide spiritual counseling to others. 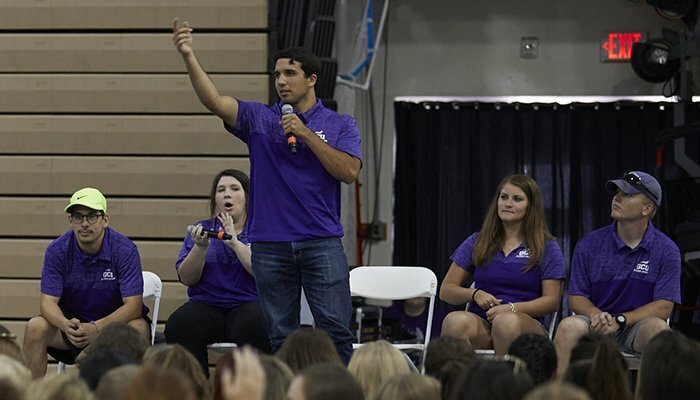 At GCU, on-campus leaders are trained and eager to help others navigate life outside the classroom. It’s both their job and their passion. The leader panel also dished out dating advice. Ty Nowatzki, a senior criminal justice major from Glendale, urged new students to avoid diving into a serious relationship. Definition: going home for Thanksgiving, realizing you are dating the wrong person and breaking up immediately after returning to campus. “I know because I’ve done it,” he said. Hord allowed students to carry the session. However, she closed with a snippet of adult wisdom. Proud of my son Luke and his fellow Lopes. They have truly found their purpose at GCU. Love GCU and what it has done for my son. Lopes up.